A European tour… should include the most popular and exciting cities, the must-see sights, picturesque scenery, and a mix of culture, history, and just plain fun. On this Best of Europe tour, you’ll experience all of this and more. You will start with visiting London, the British capital, where you could join one of our optional excursions or just enjoy time at leisure discovering the city on your own. From there, you’ll take the Eurostar train to Brussels and then carry on your journey by coach to discover many interesting destinations. 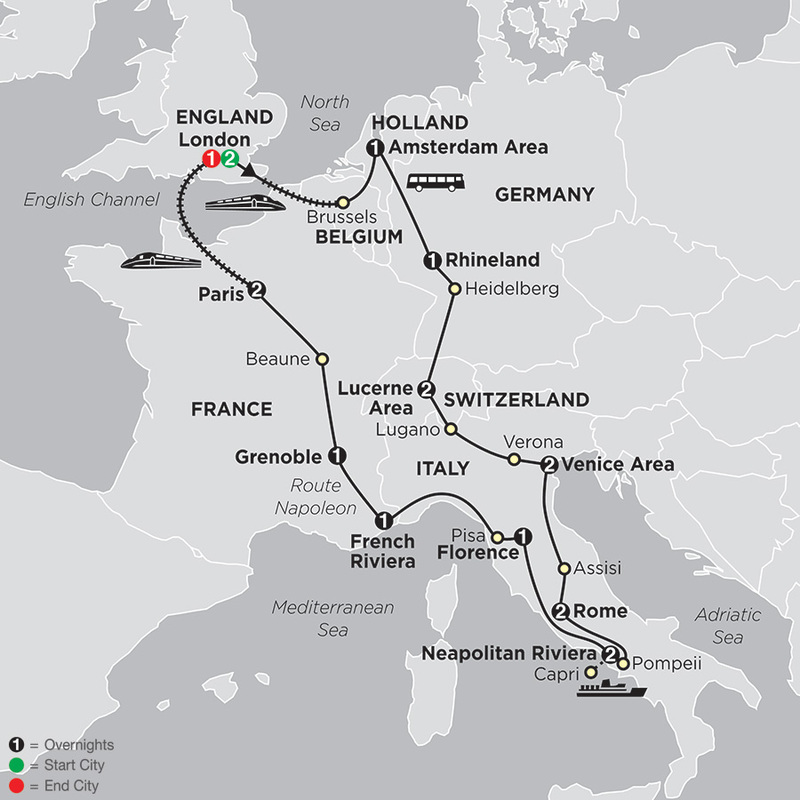 On guided sightseeing tours, you’ll visit the must-see sights—including those that will delight history fans—such as Amsterdam’s canals; Rome’s St Peter Square and the Colosseum; Florence’s renaissance old city center with a replica of the “David” by Michelangelo, Pompeii, where you’ll see what life was like during the Roman Empire before Mount Vesuvius erupted in 79 AD; Paris’s most famous landmarks and much more. On this comprehensive European tour, you’ll also enjoy spectacular scenery. You’ll drive through the picturesque Rhineland with its scenic countryside, historic castles, and charming villages, and you’ll enjoy breathtaking views of the Italian and French Riviera’s. Sit back and relax as you drive past the Burgundy vineyards in France and through gorgeous alpine scenery from Switzerland to Italy. Marvel at the beauty of Tuscany with its rural villages, rolling hills, vineyards, rows of cypress trees, and olive groves. You’ll stand in awe as you witness the blue sea and amazing views on the Sorrento coast and on the legendary island of Capri, and you’ll love the green hills and valleys as you travel through Umbria to visit Assisi. At the end of this tour of the Old Continent, you’ll take the Eurostar train back to London crossing the Channel Tunnel for more time to discover. All of this and more await you on this dream European vacation designed for value-minded travelers! Day 3: LONDON–BRUSSELS–AMSTERDAM AREA, HOLLAND. Day 12: SORRENTO AREA. EXCURSION TO CAPRI. Day 14: FLORENCE–PISA–ÈZE, FRANCE–FRENCH RIVIERA. Day 15: FRENCH RIVIERA–SAINT-ANDRÉ-LES-ALPES–ROUTE NAPOLEON–GRENOBLE.